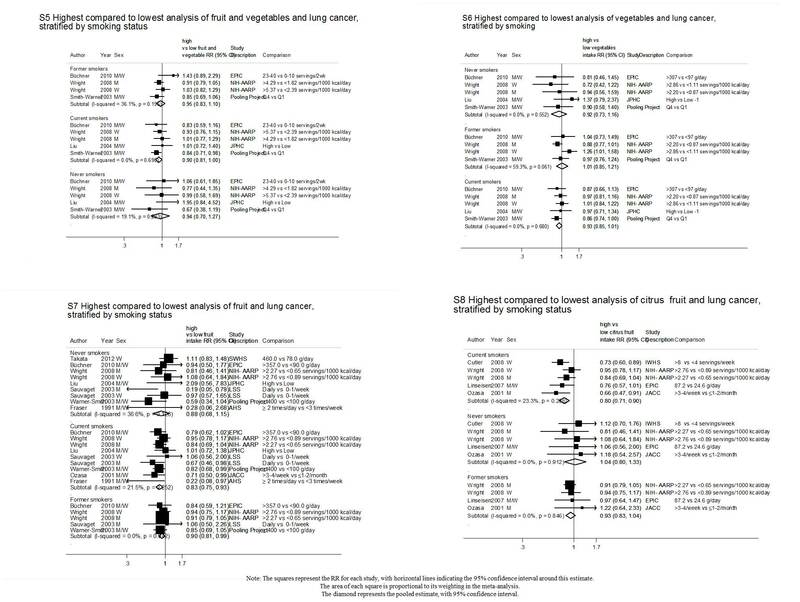 Fruits, vegetables and lung cancer risk: a systematic review and meta-analysis. BACKGROUND: Lung cancer is the most common cause of cancer death. Fruits and vegetables containing carotenoids and other antioxidants have been hypothesized to decrease lung cancer risk. As part of the WCRF International Continuous Update Project, we conducted a systematic review and meta-analysis of prospective studies. METHODS: We searched PubMed and several databases up to December 2014 for prospective studies. We conducted meta-analyses comparing highest and lowest intakes and dose-response meta-analyses to estimate summary relative risks (RRs) and 95% confidence intervals (CIs), and examine possible nonlinear associations. We combined results from the Pooling Project with the studies we identified to increase the statistical power of our analysis. RESULTS: When comparing the highest with the lowest intakes, the summary RR estimates were 0.86(95% CI: 0.78-0.94; n(studies)=18) for fruits and vegetables, 0.92(95% CI: 0.87-0.97; n=25) for vegetables and 0.82(95% CI: 0.76-0.89; n=29) for fruits. The association with fruit and vegetable intake was marginally significant in current smokers and inverse but not significant in former or never smokers. Significant inverse dose-response associations were observed for each 100 g/day increase: for fruits and vegetables (RR=0.96; 95% CI= 0.94-0.98, I(2) =64%, n=14, N(cases)=9609), vegetables (RR=0.94; 95% CI= 0.89-0.98, I(2) =48%, n=20, N=12 563), and fruits (RR=0.92; 95% CI= 0.89-0.95, I(2) =57%, n=23, N=14506). Our results were consistent among the different type of fruits and vegetables. The strength of the association differed across locations. 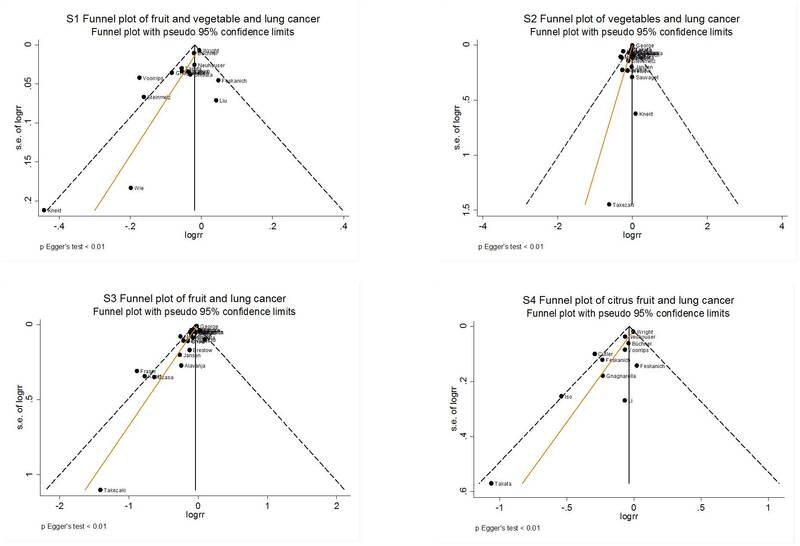 There was evidence of a non-linear relationship (p<0.01) between fruit and vegetable intake and lung cancer risk showing that no further benefit is obtained when increasing consumption above approximately 400 g per day. CONCLUSIONS: Eliminating tobacco smoking is the best strategy to prevent lung cancer. Although residual confounding by smoking cannot be ruled out, the current evidence from prospective studies is consistent with a protective role of fruit and vegetables in lung cancer aetiology.